I recently received an invitation to attend the Denver Chihuahua Meetup. Thank you, Jessica! 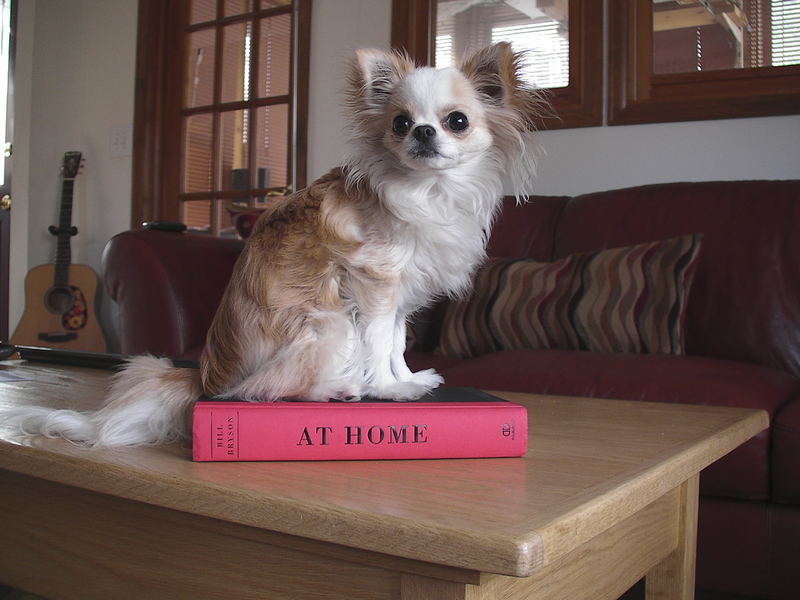 Jessica found me through FB as an author, or maybe I found her as a Chi owner. Regardless, she won my heart forever by buying six of my books to give to friends. Seriously, I want to adopt this woman. So on the Sunday after we got back from our vacation, I got my act mostly together and drove to Brighton, which has a lot of houses, horses and land, and not much else. To be fair, the horses and houses are both beautiful. The land was flat and covered with snow, so I can’t speak for it. The Meetup was at Dianne’s house and was a potluck. I brought two bags of Lindor chocolate balls, because Angel Joe was putting up the tin backsplash in the kitchen. Or maybe he was installing drawer glides. Anyway, no cooking was going to happen, because he was busy doing other things, haha. I got to Dianne’s house 15 minutes early and was met at the door by a sizable pack of Chihuahuas. “Gosh, everyone must be very punctual,” I thought. Oh, no. Those dogs represented just three people’s pets. The main event was still to come, and before we were through, there were 45 dogs in that house. I’m not sure if that included the puppies in the stroller. Let me digress to say that I’m still thinking fondly of tiny Duke, a long-haired white morsel with black ears and a black patch on his back, who although the size of a dollar bill (and worth about 400 of them), gave me a doggy kiss on my fingers and sat on my lap observing the room. Cuddling puppies is apparently serious business. You should marvel at my strength, ’cause I had a checkbook in my purse. Speaking of licking, Chiahuahuas love to lick. They particularly love to lick your mouth and up your nose. Perhaps that’s why they’re reputed to be good for asthma. There’s no scientific evidence for that claim, but if you let them have their way, I’m pretty sure they’d rout out your sinuses. You can put on makeup for a Chihuahua Meetup, but you will leave with a pink, shiny nose. Angela (naked belly), Bonnie, Charlie (a girl described as “viscious” by the shelter, who only wanted to be in your lap), Poncho, Paco, Paulo (I think there was a Paulo), Iffy (seemed plenty okay to me), Olive Ann, Cricket, Ajax or Alex, Daisy (mom of the pups), Hershey, Lola (“my Queen”), Bobo, Benny and Bob. Violet was beautiful but skittish, in the manner of supermodels. I never got close to her. Harley had one eye, an underbite and a heart condition. He looked like a junkyard bulldog that shrunk in the wash, and was impossibly sweet. Harley's tongue sometimes stuck out, too, bless him. Prolly missing some teeth. He was so cheerful. I believe there were people there, too. Someone must have brought the Chihuahuas. I’m kidding. There were lovely people there. Nancy Williams, who gives the best hugs. That's Olive Ann she's holding up. Many of them mentioned a Chihuahua named Zoie who died two months ago. She was clearly much loved. One of many things that fascinate me about Chihuahuas is how varied their colors, shapes and sizes are. straight tails, bushy tails when the rest of the dog was short-haired and sleek, stubby snouts, and long snouts like little crocodiles. There were mixes, too, and one Chinese Chin who thought he was a Chihuahua. Another thing that impresses is how well Chihuahuas get along. You have to wonder if they schooled like fish when they were in a more wild state. Several of these dogs had never been to a Meetup, some were rescues who hadn’t had much socialization, and it was wonderful to see them start playing with the other dogs. There were a few posturing contests by macho dogs, swiftly quashed by their owners. I would be interested to know how many breed Meetups there are. I’m having difficulty picturing a room full of bull terriers playing together, for example. So that was my first experience with Chihuahuas en masse, and I’m sure it won’t be the last. I’m determined to get my hands on Violet. This pink coat was my contribution to the gift exchange. Just a reminder that I have a free Christmas story available, ‘Twas the Chihuahua Before Christmas.